The Moorestown Fourth of July Committee , a non-profit organization, is having a fundraiser for the Moorestown 4th of July parade at Iron Hill Brewery & Restaurant on June 7. 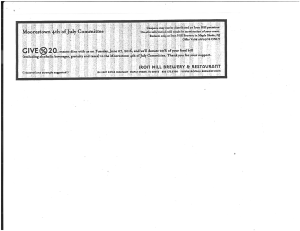 If you bring in the coupon, below, Iron Hill Brewery will donate 20 percent of your food bill (excluding alcoholic beverages, gratuity and taxes) to the Fourth of July Committee. Iron Hill Brewery is located at 124 East Kings Highway in Maple Shade. Coupons must be printed out beforehand. For more information on the committee and the parade or to donate visit moorestown4thjuly.org.